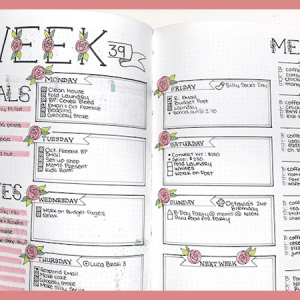 Well, for starters, the Artist’s Loft Dot Grid Journal is only $5. 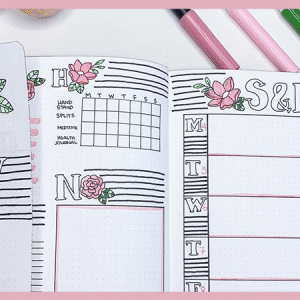 Keep reading to find out the other four reasons you should buy this dot grid journal from Michael’s. 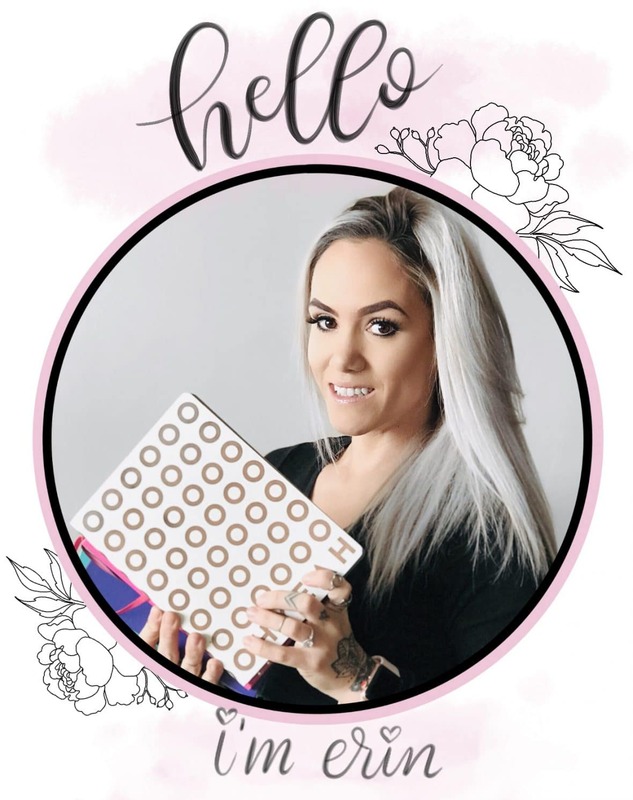 If you’re apart of any of the bullet journal Facebook groups, you probably know that Michael’s brand, Artist’s Loft, released a dot grid notebook. The journalists here in the US went crazy when they heard. It’s only $5! I had to wait about a month before my Michael’s got their shipment. Thank you, Montana; you’re always second to last at getting in the new stuff. But, nonetheless, I hurried in and grabbed one as soon as I could.
? 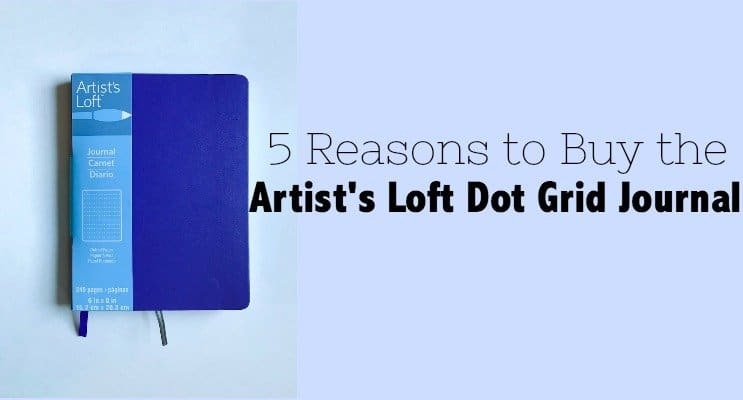 I’m sharing my thoughts on the Artist’s Loft Dot Grid Journal. The Obvious Price Factor: The most prominent reason to buy this notebook is it’s comparatively low price. Search for dot grid notebooks on Amazon, and you’ll find that most of the hardcover notebooks with more than 200 pages are at least $15. But the Artist’s Loft Dot Grid Journal is only $5. The fact that it cost less than my coffee left me with no guilt when making this purchase. 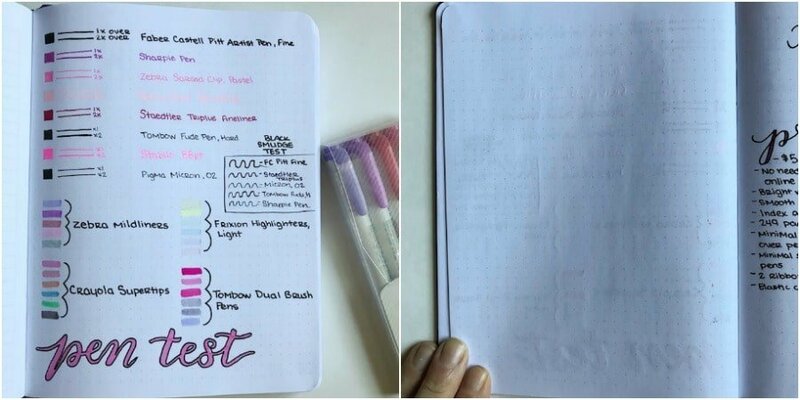 Beautifully Designed: Like it’s more expensive competition, the Artist’s Loft Dot Grid Journal has a very professional, clean design. It comes with a hard cover, elastic closure, 249 pages, and two ribbon bookmarks. The corners are rounded, which makes it less likely that they will get caught on stuff and bent or broken. , I made a box and colored it in and then added two lines. One line was a single stroke and the second was me going over the line a second time (you can see the results in the picture below). Overall, there wasn’t much ghosting or bleeding. And the smudge test was good, with only a slight smudge from a few pens.
. But, if you live near a Michael’s, there’s a good chance you’ll find the Artist’s Loft Dot Grid Journal. Also, it’s available online for the same price. If you’re anything like me, I’m all about instant gratification. Right now I’m waiting on my Gold Apple Watch Series 3, and it’s about to kill me. Chris already has his and I’m checking the order management portal every ten minutes. Sorry about the tangent; it was supposed to prove a point. For the most part, I think the pros outweigh the cons on this notebook. It’s affordable, looks nice, has fairly decent paper quality, and it’s available to a lot of people. But, of course, I’ll tell you about the things I wasn’t as impressed with.
. I use them to color in headers, highlight days, etc. They have beautiful, soft colors and dual ends. I love them. But, a few of the colors slightly bled through when I used them in the Artist’ Loft Notebook. The same thing happened with the Crayola Supertips. And this was only making one small stripe. I didn’t go over them more than once. Flimsy Cover: While the cover has a nice clean design, it’s very flimsy in comparison the LT1917. If I had to guess, I would say it’s a thin piece of cardboard covered in faux leather. No Page Numbers: I didn’t use to think this was such a bad thing, but after having a notebook with pre-numbered pages, it’s a bit of a pain to have to write your own numbers in. 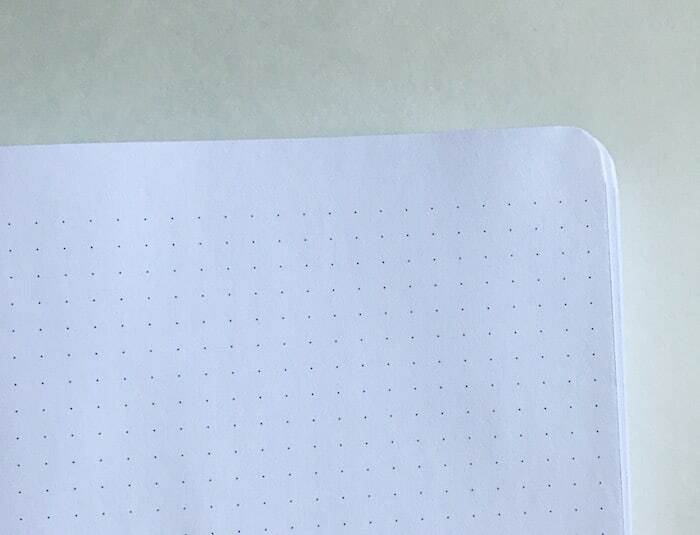 Awkward Space: You can see in the photo below that the pages have a blank row at the top that could have definitely fit another row of dots. It’s awkward and makes me a little crazy. But if you think of the glass half full, it’s a good place to put a header. This isn’t an isolated incident either. I looked at images others have posted of the journal on Facebook, and they all seem to have this design. So, what are your thoughts? Do you think the pros outweigh the cons? 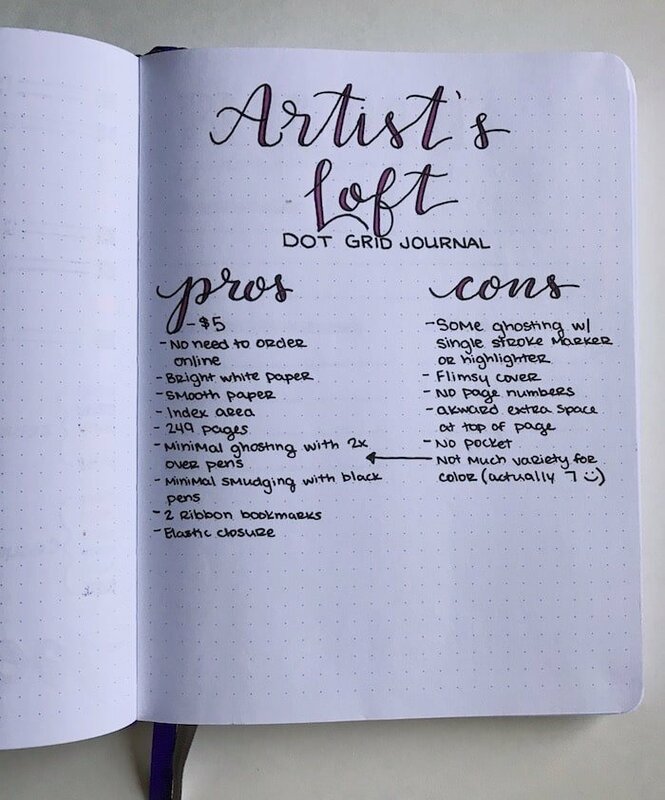 Would you or have you purchased the Artist’s Loft Dot Grid Journal? Let me know in the comments section. Thanks for the review. A lot of pros, especially if you want to experiment with layouts and formats. You’re absolutely right. It’s perfect for experimenting or trying new layouts, handwriting practice, etc. The bleed through, even the tiniest bit is a no for me that drives me crazy. And yes I to like my numbered pages. I’m so glad you like it. I think it’s awesome that there is a much more affordable version on the market that is easy to buy. It’s the perfect option if, like you, you’re just starting out. I love Microns! 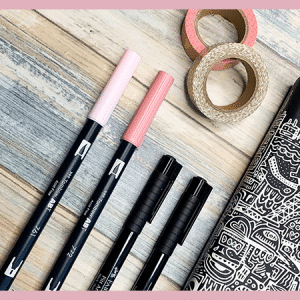 They are some of my favorite pens for every day use, and they seem to fo good in the Artist Loft journal. I hope you enjoy it! I bought the journal a few days ago, and I was so glad to find it. I like the top and bottom margins. I use the space for headlines, footnotes, or washi tape to add more color. Great review! What a neat idea! That’s a great way to use those spaces. I’m glad you like it!